Montjuric from the seaward side. Placa d' Espana lies at the base of Montjuic. Once a place of execution, the current plaza was designed by Josep Amagos for the 1929 International Exhibition. 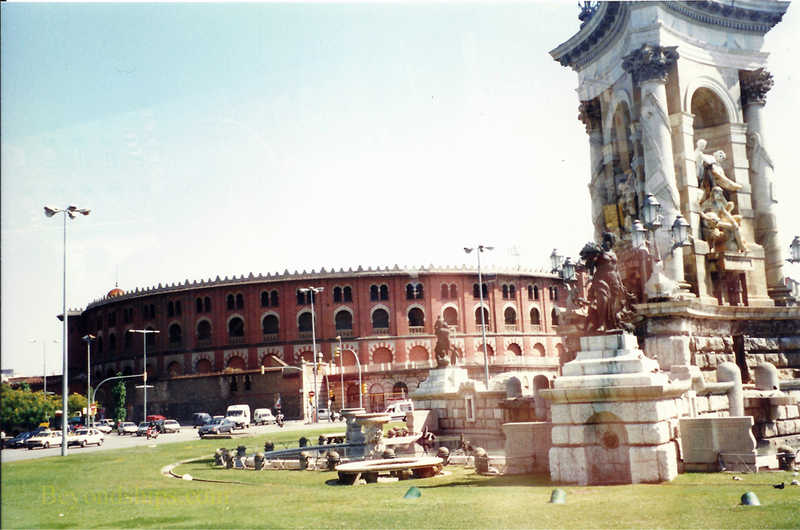 On the northern side of the plaza is the Arenas de Barcelona, the city's bullring, constructed between 1889 and 1900. Bull fighting is now banned and the last bull fight at the Arena took place in 1977. After years of laying empty, the Arena was transformed into a domed shopping center. The top level offers panoramic views of the city. In the center of the plaza is a large fountain. It was designed by Josep Maria Jugol, who was influenced by Gaudi. On the southern side of the plaza are two 154 foot towers. These were inspired by the Campanile in Venice. 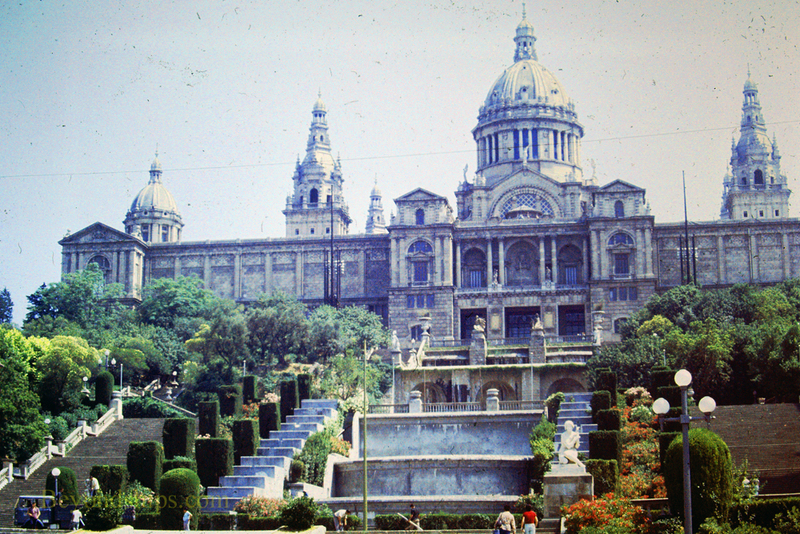 They were created for the 1929 International Exhibition and act as a gateway for an avenue leading up to Montjuic where much of the exhibition was held. Above: The bullring prior to its conversion to a shopping center. Mountjuic rises some 200 meters above the plain where most of the city is located. As such, it provides great views of the city on its northern side. On its southern side, the hill drops off steeply into the sea. 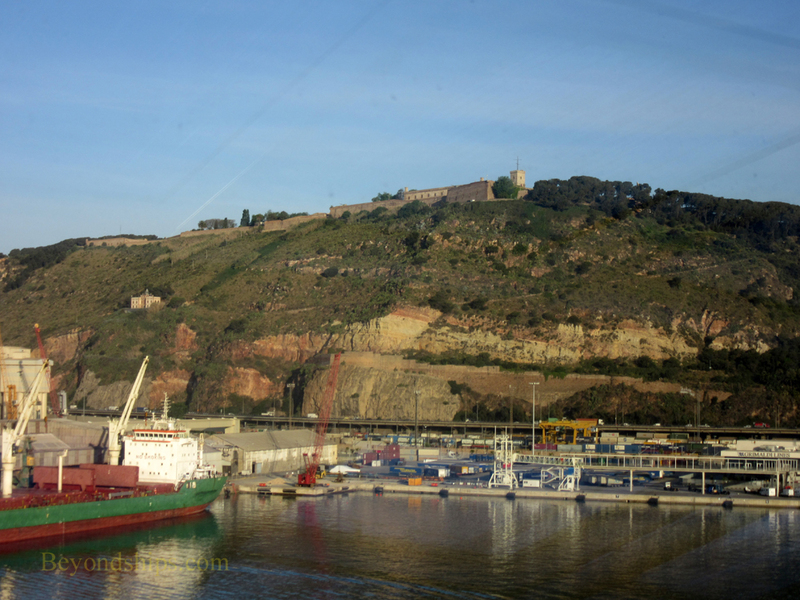 Consequently, it also offers great views of the harbor including the cruise port. 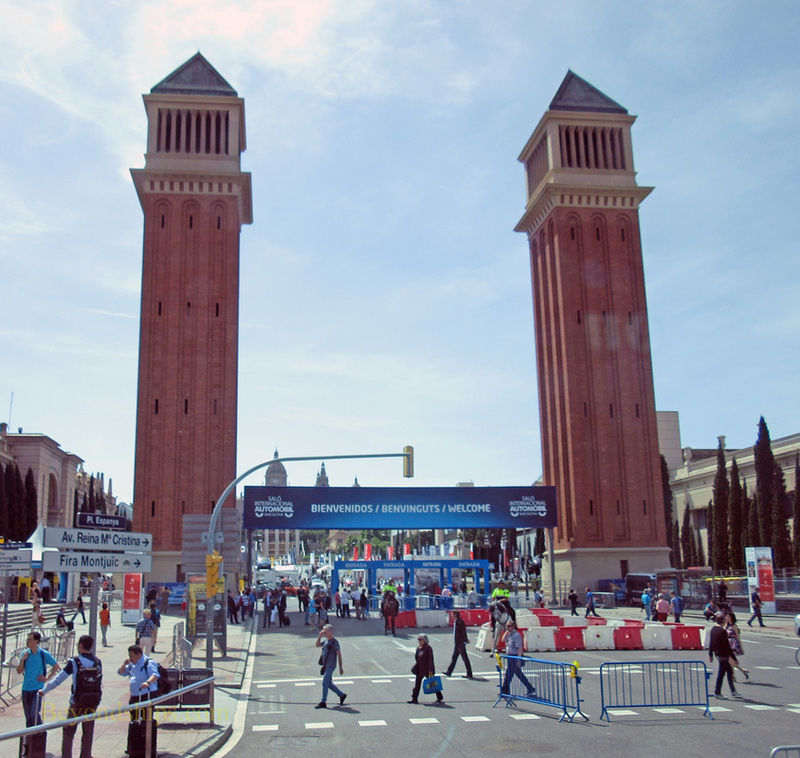 There are several attractions on Montjuic. The large beaux arts building is the Palau Nacional built as the main pavilion of the 1929 International Exhibition. Today, it is home to the National Museum of Art, know as the “MNAC.” It is primarily known for its collections of Romanesque and Gothic painting but it also has an important collection of Modernista works from the late 19th century. 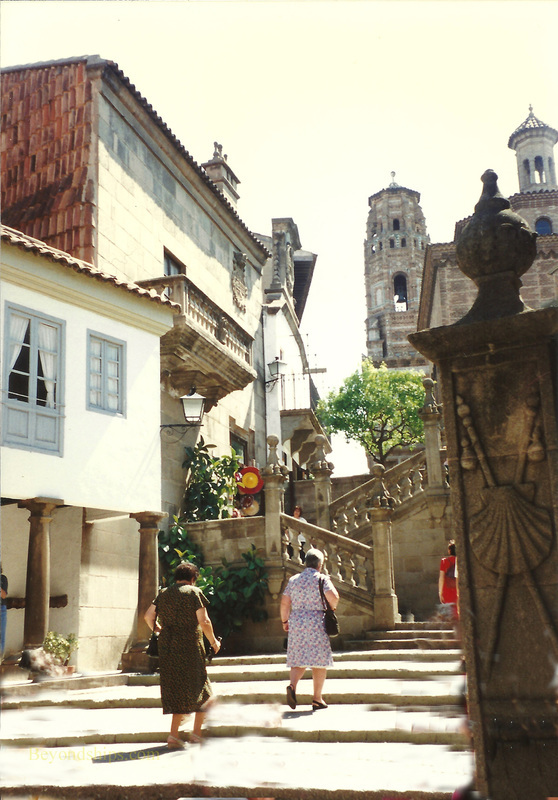 Another attraction from the 1919 Exhibition is the Spanish Village. This consists of 116 buildings that were created to show the various styles of Spanish architecture. The Village was supposed to be torn down at the end of the Exhibition but it proved so popular that it was preserved. 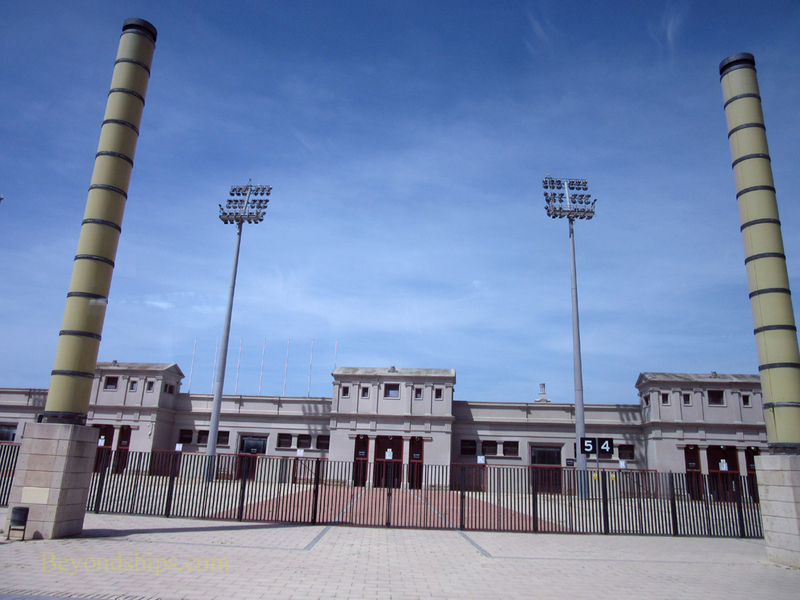 In 1992, Barcelona hosted the Summer Olympics and the main Olympic stadium is on Montjuric. There is also an Olympics Museum. 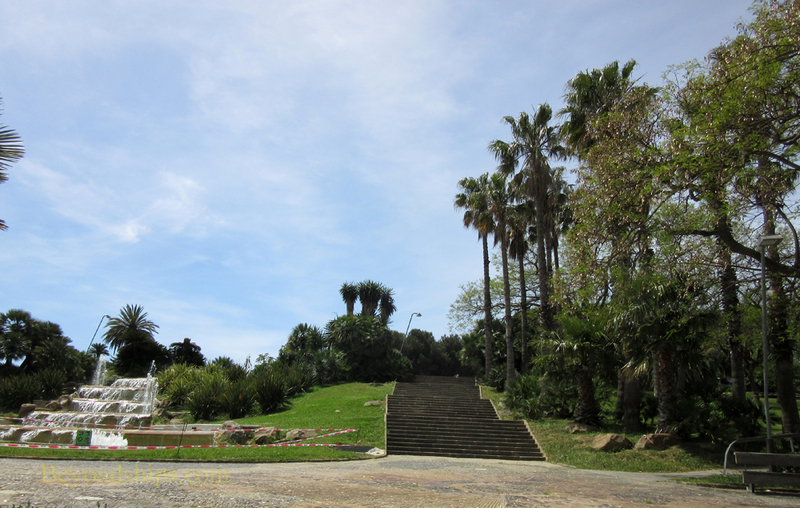 Even prior to the Olympics, Montjuric was a place of greenery. However, because of the games, it was decided to make part of the area a Botanical Garden. The plants are from places with a Mediterranean climate. However, they are grouped together geographically showing the diversity that exists even within the same climate zone. On the side of Montjuric overlooking the sea is the Castell de Montjuric. This is a late 18th century fortress on the site of a 17th century fortress. It was formerly the home of a miltary museum but now it is used for cultural events. Above: The National Museum of Art.